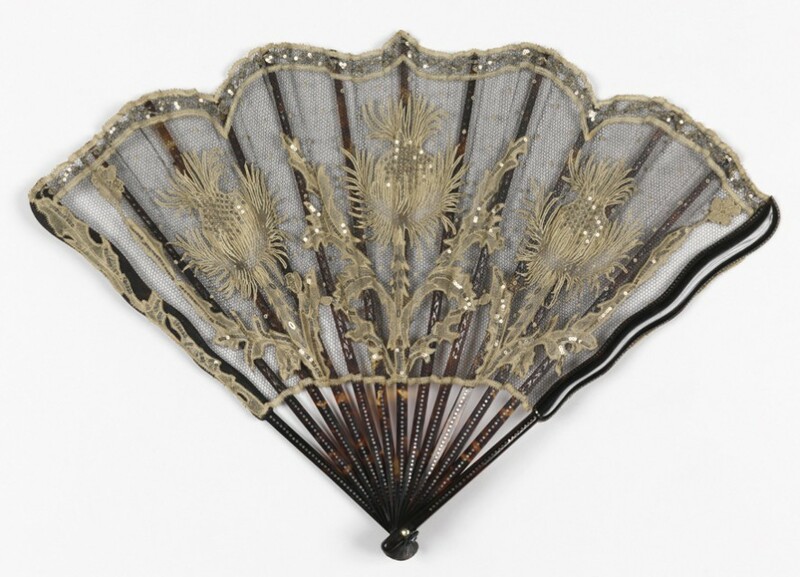 This beautiful folding fan is one of a pair of similar fans in the Art Nouveau style in the collection of Cooper-Hewitt, National Design Museum. The silk net leaves of both fans are decorated with cotton needle and bobbin lace embellished with shiny steel spangles. 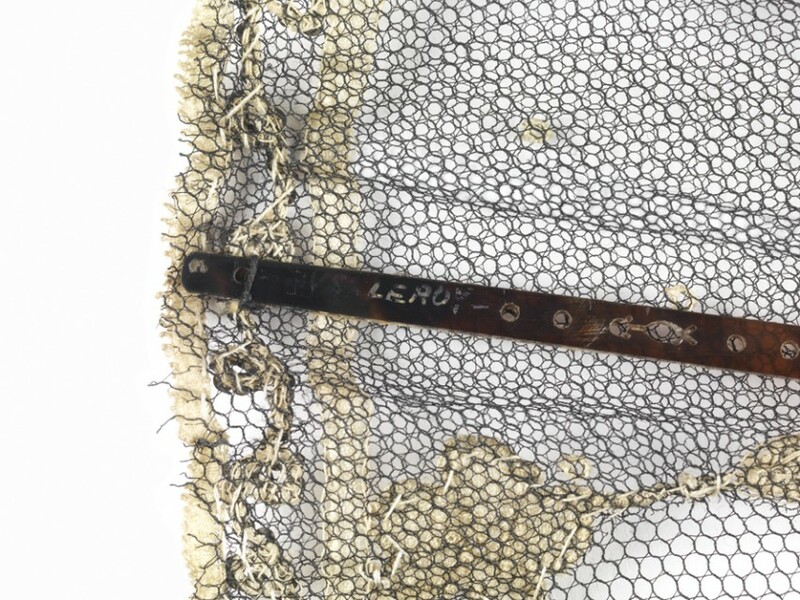 The sticks are identical in both fans and are made of tortoiseshell embedded with steel spangles. The guard sticks have a wavy, serpentine form and there is a glass stone at both rivets. Both fans depict elegant floral motifs, irises in one and thistles in the other that appear to be growing out of the foundation of the dark brown sticks. The Art Nouveau style of the fans suggests that both fans are close in date to the 1900 Exposition Universelle in Paris, which featured this new modern and decorative style. The Art Nouveau style is distinguished by sinuous curvilinear forms, often based on nature. Objects of all types, as well as art works and interior design were extremely popular in the exhibition, as seen in an interior by architect Louis Bigaux, which includes a fan-shaped decorative element above one of the doors. An article from the March 1901 edition of Les Modes provides further confirmation of the date of both fans. 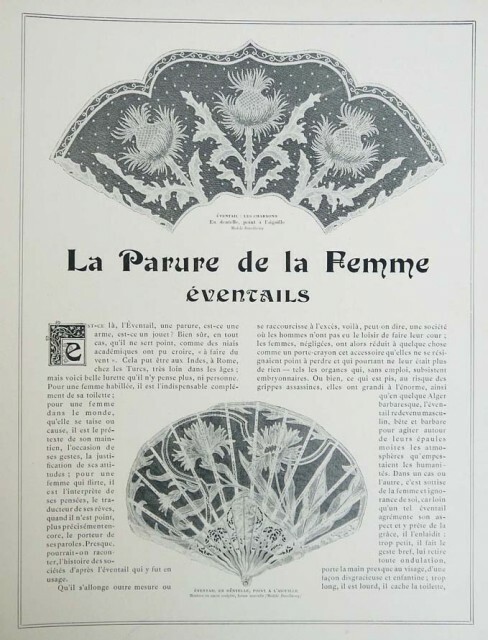 The article, entitled, “The Ornament of Women: Fans,” shows the fan with a thistle motif. The article playfully asks whether fans are “weapons or toys” for women. It suggests that the use of fans has gone beyond the practical purpose of creating a cooling breeze; fans have become an indispensable aspect of a fashionable woman’s attire, a prop for demurring in public, and skillful gesturing with a fan can communicate a range of unspoken feelings. The Les Modes article identifies the thistle-motif fan as coming from the famous Parisian fan house, Develleroy, still in existence today. 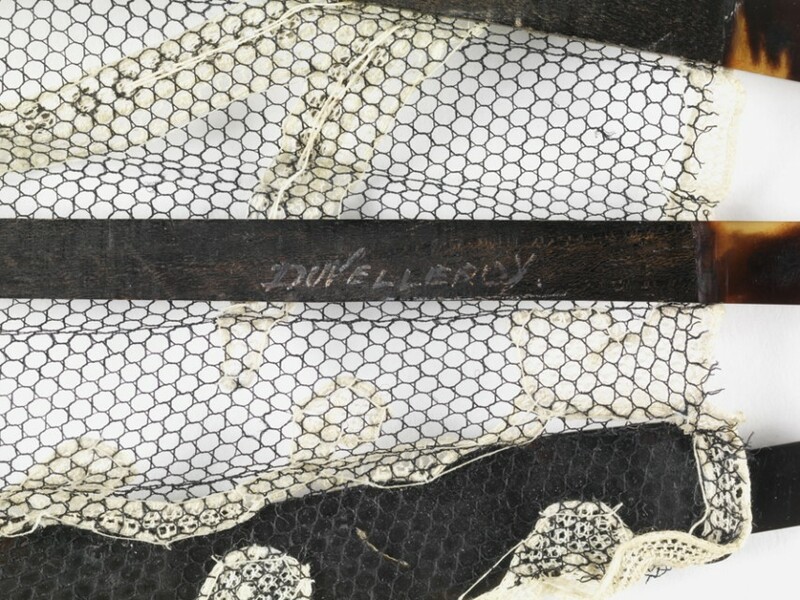 In fact, both Cooper-Hewitt fans have the name of the Parisian fan house, “Duvelleroy” inscribed on the back of one slip, which is the slender end of the stick where it extends beyond the leaf. These two elegant fans are compelling examples of the popularity of the Art Nouveau style at the turn of the 20th century.